Regardless of submitting a resignation letter, an employer often finds him/her in a position to overthink about the matter and decides that they want to keep the current job or not. 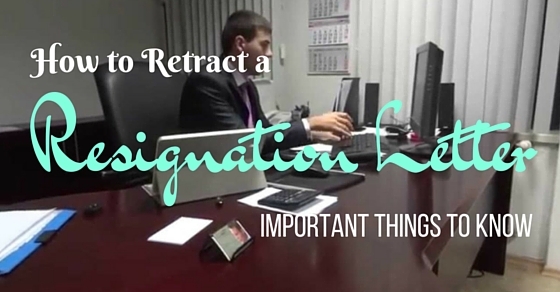 Retracting a resignation letter does not always work, but there are ways that an employer could use to nullify the resignation on time. Usually, this happens when a valued employee of the company has handed a resignation letter and the manager would try to compromise with the employee. This includes promotion offers and location changes etc. Moreover, if the said employee has already given the resignation letter and has decided to change his decision and join back to the company, then talking to the higher-ups about it can be really embarrassing. Retraction letter in its literal form is defined as a public statement or a letter that ceases, prevents, stops, withdraws or refutes the original statement and blocks the original statement from taking effect. It is done to prove the higher ups that the previous statement said is not true. Resignation in the corporate world is done to end a relationship between the employer and the employee if there is any kind of disagreement in the working terms, thus bringing the contract to an end. In reality, the employee does not have the right to unilaterally dismiss a resignation letter once submitted. But over the years, there has been a relaxation of the rule in certain areas that the employee can dismiss the resignation under special circumstances and the company is obliged to take the employee back. What if its a resignation caused due to a disagreement with the higher ups? Does the employee still have the right to cancel the resignation submitted? We often think about the situation where what if the resignation is the result of a disagreement or a fight with the boss? Does the employee have the right to cancel the resignation? The basic position of the employee is that he/she does not have the right to take back the resignation once submitted. But, in the end, it all depends on the decision made by the employer. If the employer allows the employee to dismiss the resignation letter submitted, then it is fine from both the sides. But usually in this case, when an employee submits the letter in the heat of the moment under no valid reason to leave the company, then the employer usually does not allow retraction of the letter. A more technical approach for this situation is to allow a cooling period to the employee to reflect upon his decisions and actions. The cooling period usually is a day or two. But, if the employer does not allow any cooling off period and suddenly accepts the letter by the employee, then it is concluded as a situation where the employee is dismissed by the employer and not the converse. Will this affect the employee’s future references? While discussing the references for employees, it should be noted that the references made by the previous employer should be true, precise and should not be misleading. The employer should state out the valid reason that the employee has decided to terminate the relation with the company and it would be simply wise to state that the employee resigned. When you have said something hurtful and untrue which can cause an affect to individual or a group, it is necessary to retract the original statement. Whether you do it via writing or through any other media, trying to retract a statement is often exercised as the first method for damage control. Retracting a statement may not be easy, as it involves admitting your mistakes, it can gain admiration for being honest and straightforward for most of the times. Firstly, decide on the form in which you would like to retract the original statement. If your actions have hurt or caused distress to a colleague or a higher up, a personal conversation is a good idea. If the person is busy, then also add an apology letter to the conversation. If the retraction is on the behalf of someone else or from the company, then a letter or memo is enough. Respond quickly to the request regarding retraction. When you think that the retraction is the appropriate step try to follow, then respond to the request for a retraction of the resignation letter in a written form. Taking such steps might help you to avoid any legal actions from the other party. Admit that you were wrong. Clearly, reflect upon your actions and state why your actions and behavior were wrong. Also, try to talk with the higher ups and try to negotiate with the retraction. Try to be as truthful as possible while reflecting upon your mistakes. Also, try to make a corrective statement. The corrective statement includes what was the truth behind the situation that leads to submitting your resignation letter? What could have been done instead of taking such an action? A corrective statement is a good method to avoid any legal liability. Apologize for your actions. Try to show a sincere and a truthful regret about your actions and also the consequences relating to the said action. Try to be as truthful as possible and try to tell the employer it was an honest mistake (if it was). Promise to do better in the future. An individual cannot change his past and his actions, but can certainly change his or her future. This can be done by promising the employer to be more diligent and hard working in the future. Thus, a sense of trust can be formed between the employee and the employer. Try to mend your ways and promise the employer that you will not repeat the same mistake again. Try and work hard to keep that promise. As discussed today, due to a change in the circumstances I would like to request a retraction for my resignation that I had submitted as dated (date of the resignation letter). Please accept this letter as a form of withdrawal for my above stated resignation letter. I am looking forward to working with 123 industries and I promise you, that as an employee I will work hard and try not to repeat the same mistake again. I am sorry for any inconvenience that has caused. Thank you for your understanding and discretion. It is stated by the Supreme Court of India that an individual has the right to dismiss or retract the resignation within the notice period and is entitled to the benefits of the company during that period if he or she is not allowed to work. It is also stated that an employee remains in work within that company if he or she retracts the resignation thus maintaining the relationship between the employee and the employer. A notice, once given by the employee cannot be withdrawn occasionally, unless by the employer himself. The notice is given by the employee so that the employer could search for a suitable candidate when the current employee resigns the job. This is the main reason why employees are instructed to give a sufficient amount of time so that it can provide enough time for the employers to fill the position fast. The termination of the withdrawal period from the current employee could create lots of problems. This could make the new employee jobless as he also will be resigning from his current for the search of a new job or a new prospect. This logic applies to both the employers and the employees. Employers cannot also withdraw the notice period given unilaterally. This can also cause the employees being under two employers at once. So from both the parties dismissing the resignation should be a mutual understanding. This prevents causing problems for both the employees and the employers in the future. An exception to this act could only be when the mental state of the employee was not right such that the action done was not completely voluntary. This can make the employer reconsider the decision made by the employee. These laws come under the Mental Health Act which is also stated by the Supreme Court of India. These type of retractions can be put into action if the employer submitted his resignation on the grounds of mental health or emotional grounds. This is to make sure that the resignation was not voluntary from the side of the employee and that he or she was under emotional pressure. If not, then try to think about the resignation during the notice period. This is done so that it won’t affect the next individual filling up the spot. If the organization does not accept the withdrawal request then the employee can go up to a third party so as to solve the problem on the grounds of unfair dismissal. The employee can look up for the court to solve the issue or can look up to the human resource department of the company, the trade union and other such parties. The employer also has the equal right to reconsider the decision and decide whether or not to rehire the employee. Both parties are equally obligated for taking a proper decision to the issue. One of the best methods is that the employee and the employer should discuss the various reasons or circumstances in which the employee gave his submission letter. The employer should listen to it carefully and should take an appropriate decision. If the employer does not look into the employee’s case properly and then relieve from the job, then the employee can complain against the employer on the grounds of unfair dismissal. As an employee, try to understand where you stand within the organization. At the end it is the employer who decides whether he or she should hire you. Your employer may consider retraction of the resignation under certain circumstances so the effort of requesting a retraction is still the effort from the employee’s side. The employer can accept or reject your request for retraction on the basis of the following reasons. Your employer will be able to reconsider your resignation if you have been a valuable employee in the past and the reasons for which you had submitted the resignation seems logical and understandable to the employer. The employer is less likely to accept retraction if the employer has been performing poorly in the past and the resignation was done in a raging fit or emotional pressures. Also, when the employer finds the initial reasons of resignation as illogical and sketchy. If the employer decides to give you the perk of retraction of your resignation try to prove the employer that it was a wise decision and try to make up for the inconvenience caused to the employer by working hard and showing promising results. If the employer, denies the retraction request, then as an employer you have the obligation to work in the company under the notice period. Try to prove the employer that there are no hard feelings between you and the employer and try working hard. Burning bridges when resigning or leaving a bad note can prove disastrous for you as a job aspirant since most of the future companies will contact this employer for references and assistance. If the retraction request is denied, then try to move on from the company as the job loss is inevitable. This saves your time and makes you help survive the job. Moreover, it can also provide you a situation where you can learn about the different aspects of job searching and might help you to update your resume. Previous articleWhy is it Important to Follow Rules and Procedures at Work?